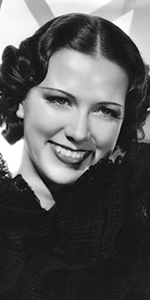 Eleanor Powell was a dancer, specializing in tap dancing. After a lightning fast career in nightclubs and Broadway revues, she quickly became a huge star at Metro-Goldwyn-Mayer. Although Powell made a small number of films, she is still considered the greatest female tap dancer — ever. Reports indicate Powell starting her dance training as early as six. By age eleven, she was discovered by Vaudeville Kiddie revue owner Gus "Star Maker" Edwards. By seventeen, Powell made her Broadway debut in The Optimists in 1928. She was featured in several other Broadway productions from 1929 to 1932 while dabbling with film work; she was an extra in Queen High (released in August, 1930) shot at the Paramount studio in Astoria, Queens, New York. In 1932, Broadway saw Powell starring in George White's Music Hall Varieties. Producer George White had done a film version of his famous Scandals show in 1934 for Fox, so when it came time to do a follow-up, Powell was "tapped" to do a number in George White's 1935 Scandals (which played the Chinese in May, 1935). Powell disliked her number, and the rest of the film as well. She returned to Broadway to star in At Home Abroad for seven months in the 1935-1936 season. Although initially cool to the reps M-G-M sent east to present her with an acting contract, Powell relented finally. Her first release for the studio, had her top-billed over Robert Taylor in Broadway Melody of 1936 (which played the Chinese in September, 1935), where she introduced the standards "Broadway Rhythm" and "You Are My Lucky Star." Audiences were enchanted. More musicals followed, all done at M-G-M, and almost all of them played the Chinese: Born to Dance (played in November, 1936), Broadway Melody of 1938 (played in August, 1937), Rosalie (which opened the day of Powell's Forecourt ceremony), Honolulu (played in February, 1939), Broadway Melody of 1940 (played in February, 1940), and Lady Be Good (played in October, 1941). 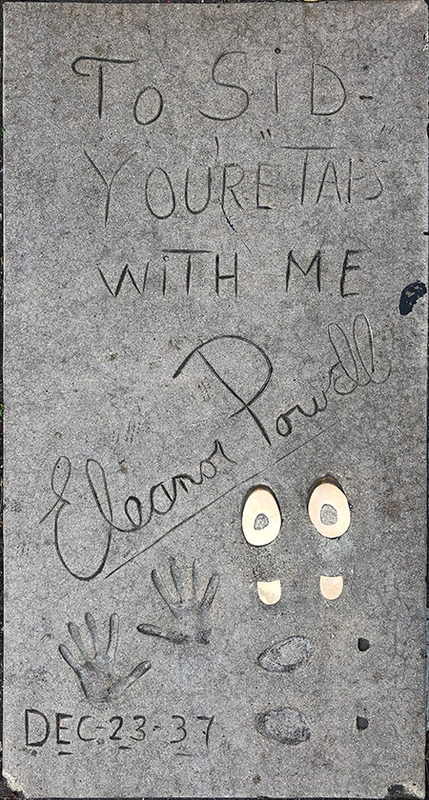 After Broadway Melody of 1940 was shot, Powell was stricken with gallstones; the painful surgery and long recovery put her on the sidelines at a critical time in her career. As the Second World War opened, M-G-M teamed her up with comedian Red Skelton and got top billing in Ship Ahoy (played the Chinese in June, 1942), but Skelton got top billing over Powell for I Dood It (played in October, 1943). After that, she left the studio. Powell starred in Sensations of 1945 (played in July, 1944), for producer Andrew L. Stone, but she knew that her movie-star days were waning. She returned to M-G-M to do a number in the Esther Williams musical Duchess of Idaho (1950). Powell had married actor Glenn Ford in 1943. Together, they had a son, Peter; raising Peter occupied her time away from the cameras (she would divorce Ford in 1959). A religious person all of her life, Powell became an ordained minister of the Unity Church. She took her Sunday school teaching style and hosted a spiritual variety / talk show called The Faith of Our Children which ran on NBC from 1954 to 1957. At her son Peter's suggestion, Powell began a nightclub career, where she showed off her long legs and maintained her athletic ability. She made guest appearances on television, including The Ed Sullivan Show and The Hollywood Palace. Eleanor Powell made her final public appearance at the American Film Institute's Lifetime Achievement Award for Fred Astaire in 1981. The following year, she passed away from cancer at the age of 69. Grauman's Chinese Theatre, Hollywood, California. 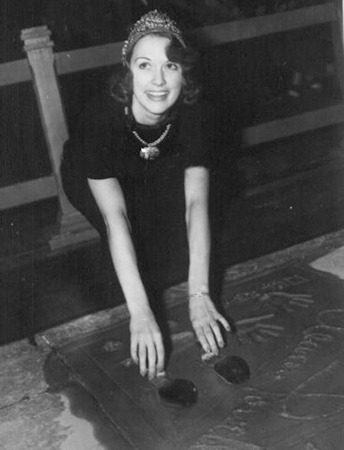 Eleanor Powell Forecourt ceremony, Monday, June 28, 1937. Powell embedded her actual sole and heel taps in the cement, which are miraculously there today.